cheero has announced the U.S. introduction of Sleepion, the world’s first electronic device that promotes deep sleep through sound, light and aroma. cheero USA, maker of highly lauded accessories for digital devices, has announced the U.S. introduction of Sleepion, the world’s first electronic device that promotes deep sleep through sound, light and aroma. The announcement was made by cheero USA COO Daisuke Higashi. Sleepion will be available via Indiegogo on February 17th. To view an intro video, click here. To view a CES video demo of Sleepion, click here. Sleepion comes complete with everything needed to help induce deep sleep. The smile shaped unit can be positioned vertically or horizontally. One touch activates the device. A speaker resonates soft, natural sounds that resemble prenatal environments and breathing. At the same time, a light from the Sleepion unit glows, simulating the moon, which science has shown regulates human biological rhythms. Light is characterized by its color temperature, and luminance. The optimal levels for sleep are 2700k in color and 35% in luminance, which perfectly mimics natural moonlight. Moonlight innately gives people a strong sense of security before falling asleep. The resonant sound tube of the Sleepion gently activates a 100 percent natural oil blend to create the proper aromas for sleep. Three oils, geranium, cedar and lavender were exclusively developed for cheero by fragrance professionals to infuse unique scents that promote and extend the deepest levels of rest. The Sleepion device is made in Japan, in colors of white, pink, blue, green and black. There will also be several stunning Urushi models offered (featuring Japanese lacquer with woodblock printing). Sleepion was tested and proven to shorten the time of transition into slow wave sleep (by 18% on average), shortened SOL (sleep onset latency) or how long it takes to get to sleep (16.7% on average) and the change of relaxation (measured by concentration of Immunoglobulin A/S-igA). 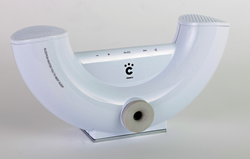 Using Sleepion increased this important marker in sleep study subjects by an average 18.3%. (see attached slides from the University Research Institute in Japan). cheero means your “cheerful digital life.” cheero USA is located at 1411 W. 190th St., Suite #200 in Gardena, California 90248. For more information, email us at info_usa(at)cheero(dot)net Please visit our cheero USA Facebook Fan Page.